Selling late model, pre-owned equipment from our large inventory. Several reconditioned skid steer loaders and compact track loaders with fresh paint and new tires/tracks. All machines are low hour, great condition, many sell with our exclusive “Franklin Facts” lifetime maintenance report. These are well maintained machines that need to sell to make room for new. Preview/inspect equipment during normal business hours. Automatic Auction Extension: Any bids placed after 5:55 PM will reset the countdown clock for the entire auction to 5 minutes. This will continue until there have been no bids for 5 minutes. Take advantage of our exclusive Franklin Facts maintenance reports. Each time one of our rental machines comes through our shop it is serviced, as Franklin Equipment goes the extra mile to ensure the quality of our machines and the resulting customer experience. All Auction Items Are Sold As-Is, Where-Is Unless Otherwise Noted in the Item Description. Several Skid Steer Loaders & Compact Track Loaders are Offered with a 6 Month Limited Powertrain Warranty. Please look closely at pictures or ask questions if you are concerned about condition or what is included with a piece. A credit card is required to bid, but your credit card will not be charged. All purchases must be paid for within 7 days of auction closing via ACH, wire transfer, bank check, cash or credit card. 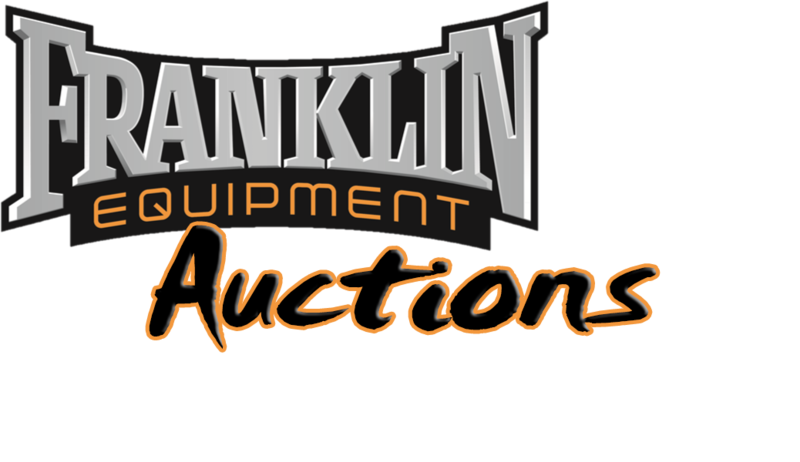 Personal checks are accepted with consent from Franklin Equipment and proper ID. A fee of $50 will apply to all returned (NSF) payments. Credit Card Payments over $5,000 will be charged an additional 3% Convenience Fee. A buyer’s convenience fee will apply to all auction purchases as follows. Purchases of less than $3,000 will be charged 8.50% of the selling price, while purchases over $3,000 will be charged 2.25% of the selling price. See each item/lot for details as to its location at the time of the auction. Buyers are responsible for all shipping costs, arrangements, and risk. Items may be picked up between Monday-Friday 8:00am – 4:00pm. Pickup outside of these times must be pre-arranged. Docks and forklifts available for loading assistance. Free Transportation to any Franklin Equipment Location (*At the convenience of Franklin Equipment). By acceptance of a bidding number, bidding or buying at this auction bidders agree to the terms and conditions as outlined below. Bidders will be solely responsible for any and all actions taken with their bidding number/account including all purchase amounts, freight, and any costs associated with collecting the same. Anyone is eligible to participate in the auction but the seller and/or auction company reserves the right to reject any and all bids unless otherwise stated. On lots selling with reserve the seller and/or auction company has the right to bid on behalf of the seller at an amount not to exceed the reserve price. Reserve price need not be stated prior to or during the auction. Seller reserves the right, with notification to the buyer, to nullify sales of items not paid for in-full within 7 days of purchase/auction date or items not picked up within 45 days of auction closing. Applicable sales tax will be collected from residents of OH, IN, WI, KY & TN.